If you have a panini press, preheat it. If you don't have one, 2 heavy skillets will work just as well. Spread a little dijon mustard on one side of one section of waffle and add the bacon, then the jalapeños, then the cheese. Top with the other section of waffle. Spread a little butter on the top of the waffle and place it butter side down on the panini press or in one of the skillets. 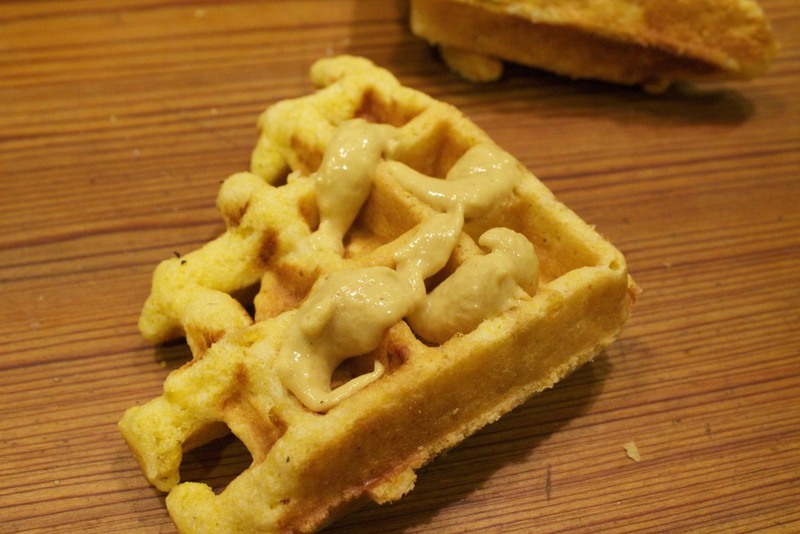 Now spread a little butter on the top of the waffle and close the press adding a little pressure to press it down. If you are using 2 skillets, don't spread the butter on the top waffle yet. Put the butter side down in the heated skillet, then but the other heavy skillet on top and press it down. After a few minutes when the bottom side is toasted, remove the top skillet and butter the top waffle, then flip the panini over and put he skillet on top again until the other side is browned. Pretty good for a bunch of leftovers! This is just what I happened to have in my refrigerator, but don't be afraid to try whatever you have on hand. Any kind of cheese and any kind of meat would work great. Posted in In The Kitchen and tagged with panini, cornbread waffle. March 15, 2013 by Lynn Adams.